At Anchorage Yacht Sales we take great pride in trying to be the best at what we do within our industry. Anchorage Yacht Sales was started more than 15 years ago with our whole focus on being more effective at professionally marketing and selling our clients boats and yachts and or helping our buying clients find their next new boat or yacht. 15 years later and we have remained Laser focused on the art of selling and buying pre-owned boats and yachts for our clients. When you consider your choices of who will be best to represent your boat for sale, consider the fact that this is the only thing that we do. We do not generate an income from service or storage or transportation or detailing, etc. We must perform well our single goal of getting your boat sold, or else we do not exist as Anchorage Yacht Sales. That alone should make it clear to you that we are a highly motivated and effective team at accomplishing the mutual goal of successfully getting your boat sold. When it comes to the other services just mentioned, we have partnered up with like-minded, goal oriented and performance driven professionals in all spectrums of the service side of the marine business- just ask us and we will be happy to provide you with a group of trusted individuals and companies that we have been using for years. No matter what your marine service needs are, we have the connections for you. We let them do what they do best and we do what we do best! Aggressive internet marketing, including 9 of the best internet sites available including Yachtworld.com, Boattrader.com, Boats.com, Marinesource.com, Boatquest.com and more! We take pride in creating the best looking ad for your boat with quality pictures and descriptions. The cover of the book must be appealing or no one will open it! If we need to move items or straighten things up for a better picture, we’ll do it! Believe me, a lot of brokers just don’t care about this, but we know how important it is! We have the ability to take select trades, which greatly enhances the probability of selling your boat. A lot of buyers need to sell or trade something before they can buy your boat. We take the risk….you look for your next boat. 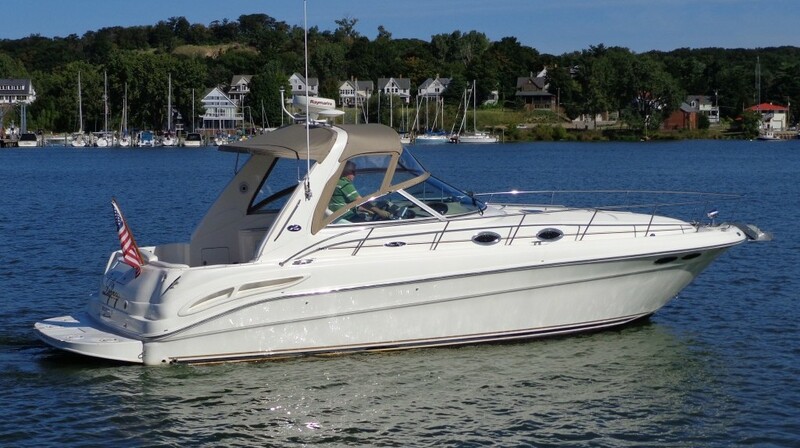 Extensive Email campaign sending out E Newsletters and new listing alerts each month keeping our boats for sale out in front of about 4,000 boaters around the Great lakes and surrounding area. We handle all aspects of the sale, including sea trials, financing and surveys…so that there are no loose ends left hanging. We do not ask our sellers to do the work that the broker should be doing. We attend several boat shows, use regional and national magazine advertising and are part of an extensive multi-listing system so that other brokers/dealers will have the ability to participate in selling your boat as well. Many times, we as professional middle men can really hear what the customer is saying, which allows us to help with overcoming objections. Often the customer will not directly tell an owner the truth about what he or she is really thinking. We are knowledgeable about all things boats, we have been to many manufacturing plants, we can explain the differences of how certain boats are built and how the individual boat systems work, we can handle boats and give lessons on how to properly operate them. We are fun to work with! !